Charles Darwin studied worms for 39 years and concluded that life on earth would not be possible without them. The main reason is because they increase soil fertility so efficiently, but also because they reduce quantities of plant waste too which is an important part of the life cycle. Let us make your educational experience so much easier and practical and see into the World of Worms with our WOW Obervational Wormery. Watch the worms at work and monitor the wonderful changes they make within the WOW as it turns the waste into compost and garden soil. The WOW Worm Farm comprises the wormery, observation panel, cover for observation panel and hinged lid. There are no nails or anything else that you need tools for, simply put the pieces in place. We have simplified the options for this fascinating activity so that it’s now as easy as possible. This is worms the way they are naturally in a single area of ground. No special feeds. No moving worms around. No special recovery prescription. There is no need to buy worms if it is going on to earth but of course you can get some if you want a running start. Realistically the worms will come up from the ground when the compost is softening for them to eat and this is the way to see worms at work naturally. You can use the WOW from the moment it is erected. 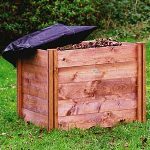 Just add organic material for composting as you would normally, making sure that there is a bit more brown material than green material if adding fruit waste. A larger version of the WOW observational wormery is available with 600lt capacity. We’re delighted to be able to offer you the Henchman Double Patio Composter. It really is a fabulous product! read on and we’ll tell you more about it………. Recycle up to 150 litres of kitchen and garden waste every 4-6 weeks.